on some knives the difference is even greater. On some less.. Here is a very interesting detail on a 91mm Officiers knife that most likely is from 1980. What is interesting on the details that I have discussed before on where the emblem with cross and shield is placed. You will find variations in the evolution and history. From 1980 the emblem with cross and shield was adapted to a stainless material on SAKs. The knife on the picture to the left is called the standard and it does have some other interesting details too. The emblem is placed lower on the scale and this you can see on the picture compared to the Spartan from mid-1980s. 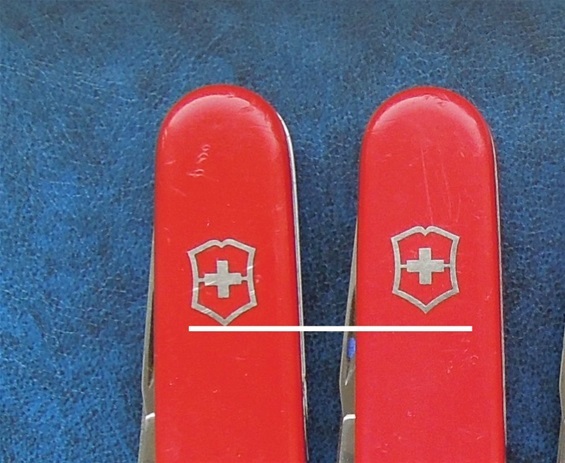 The different placing of the emblem is regardless of key ring affixture and the Standard to the left got a lower emblem when i compare it to other 1980 knives as well. The emblem is placed where some of the old economy hot stamp type was placed but not reguarly. I do not believe it to be economy just yet because the placing can have variations outside normal production variations, it does not follow economy made knives at this time window either. It is also lower placed compared to older knives. This knife got some extra factors that I must study out further. Other factors on this is the tip of the 1961 type awl without sewing eye and the can opener got some rough edges on the middle section. The main blade is 2,39 or 2,4 mm. There are some minor warping of the handle scales and they are a bit short but only very minor that said.The corkscrew is not the type used on economy made knives at this time because it got the decoration groove or partially compared to earlier ones.